This North Jackson region truly could be the best-kept secret in all of Jackson Hole for real estate development. The key to these older subdivisions that were cut up by the original 1900 settlers is the proximity to the downtown area. The zoning is also attractive for mixed-use development and the prices are still relatively low. The lodging overlay is scattered through these older neighborhoods and some of the old structures are slowly being bulldozed and used for highest and best use. Many business people are setting up shop all around this mixed-use area and it is getting more and more popular. Getting closer to the square the older motels are being renovated to nice mixed-use office/ lodges. The Miller Park Lodge is one such example of this type of activity. It now is the home of Jackson Hole Reservations and the Jackson Hole Real Estate Company. The ideal setting adjacent to Miller Park and in between the Parkway Inn and Rusty Parrot Lodge made this an outstanding property. Old locals remember the original motel as the Prospector. The property has been completely renovated and is very attractive in this setting. A new Hilton Hotel is being built on four town lots just around the corner from the Miller Park Lodge on Millward Street. It will be interesting to see how this beautiful new Lodge will affect the trend to re-develop this often overlooked area. It has the same feel as some of the old buildings that existed within a 5 block area of the downtown Square in Aspen Colorado in the 1970′s. This is definitely a sleeper area and land prices will only rise in this area. It is also the Area where the Grand Victorian Lodge was constructed in 1992. This is a bit newer platted subdivision North of Town. The property also is close to a few other small platted subdivisions near the Snake River bottomland area. These parcels anging in the 3-acre size are now being built out with some fairly nice homes. The big views once again are the dominating factor of the subdivision. The roads were nicely laid out and the view corridors from the different residence building envelopes seem to be the main attraction to Bar B Bar. Te subdivision has great access to the Airport and good proximity to the amenities of the Jackson Hole Golf and Tennis Club to the south. This golf club Resort area was purchased by Vail Resorts and has been starting to expand on the development in the past year. This Trent Jones Course truly offers the best golfing and incredible views of the Valley. Most of the North Jackson Hole Area including the Jackson Hole Golf and Tennis are perched up and elevated on a bench that magnifies the Teton Range. The driving range points directly at the Grand Teton giving golfers a surreal feeling as they swing away. The original plats and lots were nicely laid out and have many older larger and well-kept homes ranging from $1.5 million and up in price. There are a few Condominiums that flank the project and are the only lodging overlay short -term rentals allowed by the County. They are referred to as Teton Shadows and Golf Creek Townhomes, which are valued between 400,000 and $800,000. They are older units and have been upgraded and are meticulously landscaped to capture awesome privacy and views of the Grand Teton. The values in this area will continue to rise as the exclusive West Bank Regions get too expensive due to a shortage of inventory. This development is also close to the Jackson Hole Airport and 5 miles from Downtown Jackson Hole. 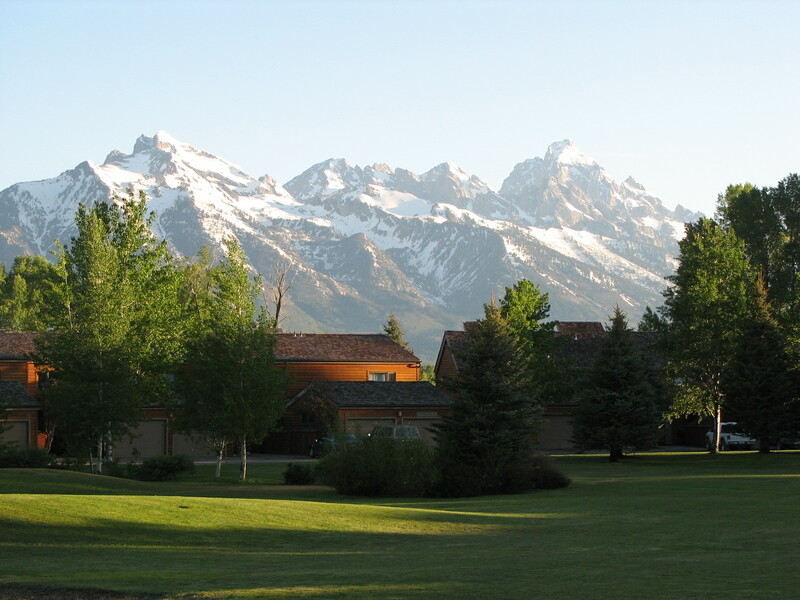 These 2 subdivisions feature 3-acre parcels, allow horses and have big Teton Views. They are fairly exposed on the bench area above the Snake River. The lots are flat and not protected by much natural screening. These subdivisions are a bit older and are home to many locals who bought early on and built modest to medium quality private residences. The area is still receiving a lot of attention from new second home buyers who are remodeling or building new homes in this more moderately priced area north of town. These development areas are also close to the Airport and have great access to the Jackson Hole Golf and Tennis Club. The solitude subdivision is an older region, North of the Jackson Hole Airport and continues to be strong selling properties. The subdivision is accessed off the same road as the Jackson Hole Golf and Tennis Club. It drops off down into the low lying areas of the Snake River and is heavily wooded with large native Cottonwood, fir and pine trees. Some of the lots have natural clearings to the North allowing for incredible unobstructed views of the Grand Teton and Front Range area. There are a few lots still undeveloped and would sell for $750,000 and above if they were listed. The homes are mostly log homes and range from $1.5 million and upward. There are Snake River access points for the homeowners to enjoy as well as nice hiking trails within the subdivision. There are a few properties with some live water on them coming from the Snake River tributaries. 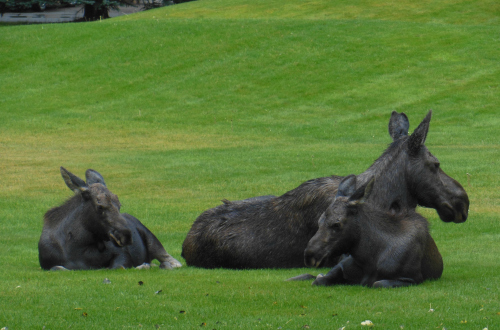 These are probably the newest exclusive lots North of Jackson Hole. Similar to the Solitude area this subdivision is close to the Snake River drainage and offer spectacular views of the Grand Teton and Front Range area. The lots are approximately 3 acres and the homes being built in these areas are among the nicest in the Jackson Hole area. The property features include water features and also have native trees for nice screening between the home sites. There are beautiful new luxury homes being built in this popular subdivision. Some owners have bought multiple lots to build larger homes and guest houses with large ponds. Privacy and views of this region are key to the prices being well into the million dollars plus range. The Buffalo Valley Subdivision region for north of Jackson Real Estate is about 5 miles north of the Moran Entrance to Grand Teton and Yellowstone National Parks. It has many different areas and is a mix of smaller and larger tracts with a few ranches in the middle. There are spectacular views of the Buffalo Fork River and views to the south overlooking the Grand Teton and Front Range area. Some of the lots and homes are on hillsides and others are in the flat bench areas overlooking the river. The homes are a mix of older and historic cabins to a few newer more exclusive homes. There are many locals who commute the 1-hour drive to the town of Jackson Hole year round. 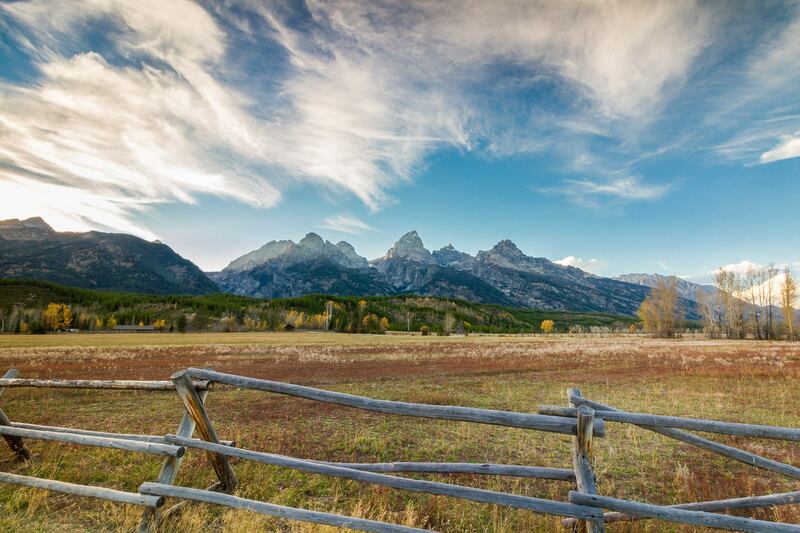 There are excellent hiking and trailheads for horses adjoining the Buffalo Valley and the area has become a popular hunting and fishing Mecca for the Jackson Hole Outdoorsman. Prices range from $500,000 and up for lots and homes in this scenic area.